Baseball fans who watched Chet Lemon during his 16-year major-league career likely recall the speedy outfielder racing across the field at Comiskey Park or Tiger Stadium to track down a line drive headed for the gap. Just as likely, they can still see him diving headlong into first base or getting hit by a pitch. But fans of the Chicago White Sox and Detroit Tigers, especially those who watched him day in and day out, remember him as being hard-nosed in the field and dangerous at the plate. Chester Earl Lemon was born in Jackson, Mississippi, on February 12, 1955. Though his roots were in the Gulf Coast, Lemon’s baseball star began to rise in Southern California. He starred at Fremont High School in Los Angeles -- a pipeline for big leaguers from that era including Willie Crawford, Bob Watson, Bobby Tolan, and George Hendrick. On June 6, 1972, the Oakland Athletics selected him in the first round of the amateur draft with the 22nd overall pick. Lemon was signed by A’s scout Phil Pote and at the age of 17 arrived in Oregon to join his first professional club, the short-season Coos Bay-North Bend A’s. Playing third base and shortstop, Lemon appeared in 38 games and batted .286 with a pair of home runs. Later in the season he moved on to the Burlington (Iowa) Bees of the Midwest League and joined future major leaguers Dan Ford and Champ Summers for the balance of the 1972 season. Lemon hit .256 in 36 games, primarily at third base. He returned to Burlington in 1973 for his first full season in the minors and posted sterling numbers -- a .309 average, 19 home runs, 88 runs batted in, and a .513 slugging percentage -- while holding down third base for the Bees. In 1974 Oakland promoted Lemon to the Double-A Birmingham A’s of the Southern League, and his performance didn’t disappoint -- at least at the plate. He finished the year at .290, which was good for second on the A’s roster, but still 71 points behind team leader and future White Sox teammate Claudell Washington. In the field, however, Lemon gave the A’s an early indication that his future wasn’t likely to include an infielder’s glove: He made 19 errors at third and another four at shortstop -- down from 36 errors the year before. Lemon’s porous defense didn’t prevent the A’s from promoting him to Triple-A Tucson of the Pacific Coast League for the 1975 season -- nor did it nudge them toward identifying a new position for the 20-year-old. Nevertheless, Lemon continued to hit, batting .280 with the Toros. Two months into the season, on June 15, Lemon’s career took an unexpected turn when he was traded to the Chicago White Sox organization for pitchers Stan Bahnsen and Skip Pitlock. On September 9, 1975, Lemon made his major-league debut, against the California Angels’ Jim Brewer, grounding out to first base in the ninth inning of a 5-4 loss at Comiskey. Ten days later he got his first big-league start at third base -- batting seventh -- against the Rangers in Chicago. His first major-league hit, a single to right, came in the bottom of the second inning off Steve Hargan; he scooted to second base courtesy of an error by Texas right fielder Jeff Burroughs. Lemon finished the game 1-for-4 with a run scored and was flawless in the field, notching three putouts and a pair of assists. All told, he appeared in nine games that season, batting .257 and committing one error at third base and none in the outfield. The 1976 season was one of dramatic change for both the White Sox and Lemon. Paul Richards replaced Tanner at the helm, owner Bill Veeck unveiled a set of retro uniforms with collars and, on some occasions, short pants, and Lemon became the White Sox’ new leadoff hitter and center fielder. Six weeks into season, he hit his first major-league home run. “It was off Frank Tanana of the Angels,” Lemon said. “They were beating us and I took him into the upper deck. After the game I remember hearing him on the radio and he said something like, ‘Well we had a big lead and I just threw the rookie a changeup.’ I thought to myself, ‘OK, I’m going to own you from now on.’ And I did. He even came up to me one time and told me that I owned him.” (Lemon’s final career stats against Tanana: a .272 average with six homers and 20 RBIs in 94 plate appearances. Only Rickey Henderson, with 11, and Mark McGwire, with seven, hit more homers off Tanana than Lemon; one has to keep in mind, however, that Lemon and Tanana were teammates on the Detroit Tigers from June 20, 1985, through the 1990 season.) The White Sox finished sixth in the American League West that year at 64-97 but the groundwork was set for an exciting 1977 for the club -- and for their center fielder. Entering his third season in the majors, Chet Lemon found himself playing for another Lemon -- Bob -- and Chet saw his career trajectory soar. He had a solid year at the plate -- a .273 average, 19 homers, and 67 RBIs -- and was an essential part of a club that White Sox fans dubbed the South Side Hit Men. Lemon, Richie Zisk, Eric Soderholm, and Oscar Gamble powered an offense that scored 884 runs and fueled the South Siders’ 26-game improvement from 1976. The club finished third with a 90-72 record -- four games back of the Rangers and a dozen behind the powerhouse Kansas City Royals. Lemon’s 509 putouts in center field in 1977 set a major-league record that still stood in 2010. This factoid remains Lemon’s greatest accomplishment and says a lot about his incredible talent and will forever be his legacy. It’s one reason he was known as Chet the Jet; while not the greatest of baserunners, his speed in the field enabled him to catch many balls that would have dropped in for hits. Lemon took another step forward in 1978 when he was named to the American League All-Star team -- he entered the game as a defensive replacement for Jim Rice in the eighth -- and hit an even .300 for the first time. He returned to the All-Star Game in 1979 and saw action almost immediately. In the second inning, he replaced Fred Lynn in center field and came to the plate in the third against the Astros’ Joaquin Andujar. Lemon was hit by Andujar’s pitch and later came around to score. He finished the game 0-for-2 with a walk and the HBP. The 1979 campaign turned out to be Lemon’s finest all-around offensive season. In addition to leading the American League with 44 doubles, he set career highs in average (.318) and RBIs (86) and hit 17 home runs -- more than his career average of 13 per season. In 1980 he crafted another sturdy year: .292 with 11 homers. His average broke the .300-mark again in the strike-shortened 1981 season, when he hit .302 with nine home runs and 50 RBIs. After that season, Lemon’s time in Chicago came to an end. Just after Thanksgiving 1981, he was traded to the Tigers for outfielder Steve Kemp. When Lemon arrived in Lakeland, Florida, for his first spring training as a member of the Tigers, manager Sparky Anderson had him penciled in as the Tigers’ leadoff hitter and right fielder, shifting from center to accommodate up-and-comer Kirk Gibson. Pulled rib-cage muscles shelved Lemon for the final two weeks of Grapefruit League action, delaying his regular-season Tigers debut until the sixth game of the year, against the Toronto Blue Jays at Exhibition Stadium in Toronto. In the ninth inning, the Tigers were down 4-0 and Lemon was called on to pinch-hit for Richie Hebner. He promptly stroked a single to center, driving in two runs, as Detroit battled back to tie the game, though they eventually lost 5-4. The next day Lemon played in his first opening day at Tiger Stadium in a Detroit uniform and led off the bottom of the first with a single. In his second at-bat, naturally, Lemon was hit by a Dave Stieb pitch. He remained almost exclusively the Tigers’ leadoff hitter through late June, when he began bouncing from second in the order to seventh, and all points in between. He finished his first year in Detroit with a .266 average, 19 home runs, and 52 RBIs. Defensively, Lemon played 96 games in right field and 27 in center -- the position he’d soon call home for good. In 1983 Lemon played all but two games in center field and cemented himself as the Tigers’ fifth-place hitter. On July 24 he made a game-saving catch that ranks as one of the finest of his time in Detroit. The Tigers and Angels played a nail-biter in Anaheim and Detroit took a 4-3 lead in the top of the 12th on a home run by Lance Parrish. In the bottom of the inning, with the tying run at first and two out, Angels first basemen Rod Carew launched an Aurelio Lopez pitch to the deepest part of Angels Stadium. Lemon turned, tracked the ball, and with impeccable precision leaped to take away a game-winning home run with a beyond-the-wall catch, securing the win and keeping Detroit a half-game behind the Baltimore Orioles. The Tigers finished 1983 six games back of Baltimore, and were confident of what the emerging club could accomplish in 1984. For the first time in his career, Lemon eclipsed the 20-homer mark, finishing the ’83 season with 24 round-trippers to go along with a .255 average and 69 RBIs. In the three-game American League Championship Series against the Kansas City Royals, Lemon went hitless but scored the lone run in the Game Three as the Tigers clinched the franchise’s first pennant since 1968. In the World Series, he showed the rest of the country what Tigers fans had grown accustomed to. In Game Three, an otherwise ugly game, Lemon dazzled. “When the ball was hit I went back as far as I could,” Lemon said. “I had been playing shallow because we watched (Kennedy) in San Diego and with two strikes he’d just be trying to make contact. After I got back on it, I just looked up, reached up, and it was there. The rest is history.” The Padres were left shaking their heads. “We still had a chance if Lemon doesn’t make that catch,” Steve Garvey said. At the plate, Lemon stroked two singles and scored on Marty Castillo’s two-run homer in the third. But in a game mired by 14 men left on base by the Tigers and 11 walks by three Padres pitchers, “(Lemon’s catch) was the only tingle of the night,” wrote Joe Falls of the News. Lemon batted .294 in the Tigers’ four-games-to-one World Series victory. He maintained his sturdy and reliable play for Detroit over the next three seasons, averaging 139 games in the field and 17 home runs at the plate. In 1987 the Tigers made a late-season charge into the playoffs by sweeping the Toronto Blue Jays on the final weekend of the season to capture the American League East title. Though the Tigers lost in five games to an overachieving Minnesota Twins club, Lemon had his best postseason, batting .274 with a pair of home runs in the American League Championship Series. The next season, 1988, he found himself moving back to right field, making way for newly acquired center fielder Gary Pettis. 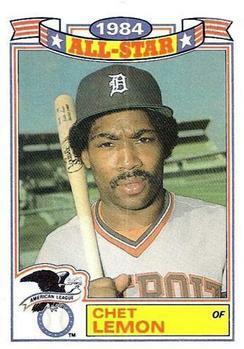 It was also Lemon’s last season as an offensive threat for the Tigers; he hit.264 with 17 home runs. Though he was still a regular in the lineup in 1989 and ’90, he was watching his career draw to a close. On April 5, 1991, at the end of spring training, the Tigers gave the 35-year-old Lemon his unconditional release. After intensive treatment, Lemon rebounded from his illness and began coaching high-school baseball in the Central Florida area. In 1993 he started the Chet Lemon School of Baseball, and became the president of the Amateur Athletic Union district near Orlando. Lemon and his wife, the former Valerie Jones, have four children, Geneva, Chester, Jr., David, and Marcus. Marcus Lemon spent his fifth season in the Texas Rangers’ system in 2010. Originally a shortstop, the younger Lemon also was tried at second base and left field as the Rangers looked for the best fit for Chet’s son. Anderson, Sparky. Bless You Boys: Diary of the Detroit Tigers' 1984 Season. Chicago: Contemporary Books. 1984. Detroit Tigers. Detroit Tigers 1984 Media Guide. Detroit: Detroit Tigers. 1984. Detroit Tigers. Detroit Tigers 1987 Media Guide. Detroit: Detroit Tigers. 1987. Associated Press. “Chet Lemon Is Placed On Waivers by Tigers.” New York Times, April 6, 1991. Associated Press. “Kemp Traded for Lemon.” Toledo Blade, November 28, 1981. Falls, Joe. “51,970 found guilty of impersonating Tiger fans.” Detroit News, October. 13, 1984. Henning, Lynn. “Lemon’s catch a-Mays-ing as he thwarts comeback.” Detroit News, October 13, 1983. Chet Lemon’s Baseball-Reference.com page: http://www.baseball-reference.com/players/l/lemonch01.shtml. White Sox Interactive interview with Chet Lemon: http://www.whitesoxinteractive.com/rwas/index.php?category=11&id=2719. McClary, Mike. Telephone interview with Roland Hemond, November 13, 2009.